The Marines want better body armor. Acting on widespread complaints from its troops in Iraq and Afghanistan, the Marine Corps has ordered major modifications to its body armor to improve comfort, mobility and safety, The Associated Press has learned. The decision results from a survey of more than 1,000 Marines, many of whom reported that their flak jackets, which cost the Marine Corps more than $100 million, were too heavy and restrictive. "The Marine Corps is developing an Improved Modular Tactical Vest to address the problem areas uncovered by the survey results," Capt. Geraldine Carey, a Marine spokeswoman, told the AP by e-mail last week. 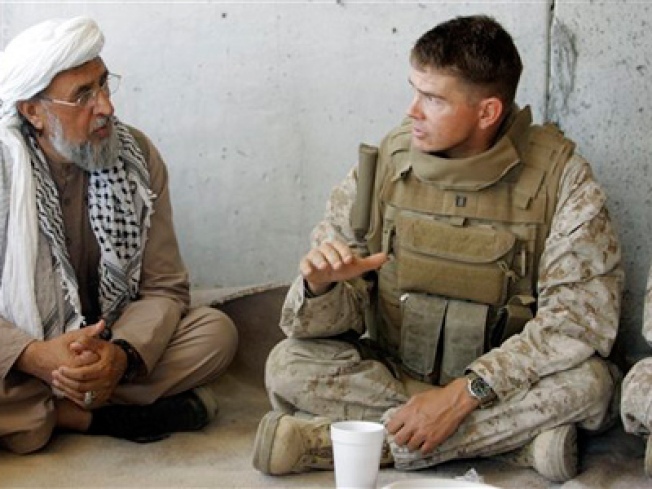 Earlier in 2008, the Marine Commandant, Gen. James Conway, temporarily suspended an order for more than 20,000 of the so-called Modular Tactical Vests. "I've worn the vest on my travels into Iraq and Afghanistan, and I can tell you those Marines have raised some valid points," Conway told the AP by e-mail. Body armor has been an issue since the Iraq war began in 2003. The Army reportedly had a shortage of the ceramic protective plates needed to make vests effective, and lawmakers demanded answers from the Department of Defense after reports surfaced of soldiers' families buying the plates themselves and sending them to Iraq. The Marine Corps has been ahead in distributing adequate body armor and replacement parts to its troops, though it too has struggled to adapt and fine-tune the technology in an ever-changing urban warfare environment. The vest now used by the Marines in Iraq is the Corps' third since 2001. There are other lighter types of body armor that are widely used by police but they are not approved for combat. The Modular Tactical Vest, designed by the Marine Corps to improve on an older jacket, has a track record of stopping bullets and shrapnel. It was designed to better protect the kidneys, lower back and torso in urban combat, and make it easier to carry ammunition, water and grenades. The vest was the top choice of troops who tested it before a manufacturer was awarded the contract, according to Lt. Col. T.V. Johnson, Conway's spokesman. Marine and Pentagon officials said it has a proven record of protecting troops, and Carey said there are no reports of failings that resulted in injury or death during combat. But troops in the field started complaining almost as soon as the vests were issued in 2007. At 30 pounds it is bulky and between one to three pounds heavier than its predecessor depending on its size, adding to the burden on Marines who carry more than 90 pounds of gear. Army officials testifying before Congress in 2007 said they turned down the vest because it was heavier and no more effective than what the Army was using. Because the vest rides higher on the chest for added protection, and features shoulder straps and buckles for adjustment and quick removal, several Marines blamed it for causing facial bruises when rifle butts slipped during recoil. To better shoulder their weapon, some Marines loosened straps to lower the vest, exposing their upper torsos, according to a Marine field commander in Iraq who spoke on condition of anonymity because it is against policy for troops to alter the vest. Told of the practice by the AP, Conway said: "Any decision to scale down levels of protection for the sake of comfort is wholly unacceptable." The vest has a tab for quickly removing the vest to prevent a tragedy, such as when a Marine in an older jacket couldn't remove it and drowned. But Marines complained that the tab snagged equipment, and are now told to tuck away the tab. Unlike previous jackets, which Marines could just throw on and go, this one requires training or online video courses on how to wear it. An initial 84,000 vests at a cost of more than $84 million were ordered in September 2006, nine months after an urgent request came in from the field for better protection. Conway, who became commandant after the contract was issued, put a hold on the last batch of 20,000 vests, questioning their design and testing. He later lifted the suspension and the Marine Corps ordered more than $17 million worth of vests and replacement parts over the summer. The current vest costs about $1,050, according to Lt. Col. A.J. Pasagian, who oversaw the survey at Quantico, Va.. The price of the improved vest wasn't immediately known.